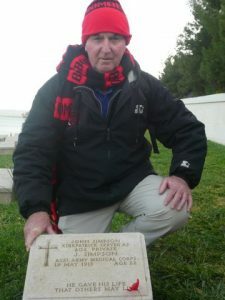 IT is 6 pm on the April 24, 2012 and we have secured our seats in preparation for the long night ahead and the much -anticipated Dawn Service at the Anzac Commemorative Site, Anzac Cove on the Gallipoli Peninsula in Turkey. The weather forecast is promising, 10 deg overnight and no rain in contrast to other years that have experienced temperatures below zero overnight. We had our sleeping bags, layers of clothes and heavy jackets so we settled in for the long night ahead. This is a major event to organise and the Australian and New Zealand Governments along with the Government of Turkey has to be congratulated on the organisation that must go in to making this a safe and well run major event. Mayor Tony Foster at the gravestone of the Anzac stretcher bearer John Simpson Kirkpatrick, better known as 'the man with the donkey'. The push by the so-called Tasmanians for Reform group (in reality the Property Council representing big property owners) for council amalgamations in Tasmania leaves several critical questions unanswered. BRIGHTON Council has kept its rate rise to the annual increase in CPI with the general rate to go up by just $16 per house next year, or 31 cents a week.